Registration and Records creates and maintains accurate student records while helping students navigate the college’s policies and procedures. We assist students, faculty and staff with enrollment, grading and graduation functions and assures that accurate enrollment and graduation data are reported to the state and federal government. The Registration and Records office processes student enrollment and withdrawal transactions and maintains student transcripts and records. Students may contact the Registration office when they have questions about transferring credits from other schools, to add or drop classes or to access other information related to enrollment at Highline by emailing registration@highline.edu or by calling (206) 542-3242. Highline honors academic credits earned at other regionally accredited institutions that are equivalent in academic level nature to work offered at Highline. Highline subscribes to statewide Policy on Inter-College Transfer and Articulation among Washington Public Colleges and Universities agreed to by regionally accredited colleges and universities of Washington the State Board for Community and Technical Colleges and adopted by the Higher Education Coordinating Board in February 1986. The policy describes the rights and responsibilities of students and review and appeal process in transfer credit disputes. Washington state community and technical colleges (CTCs) offer reciprocity to transfer degree-seeking students who move from college to college within the CTC system. Students who have fulfilled entire areas of their transfer degree requirements at one college - for example, Quantitative Skills, Communications or Distribution Area requirements - will be considered to have met those same requirements if they transfer to another community or technical college in Washington state. Students must initiate the review process and must be prepared to provide necessary documentation. For complete information, contact the Graduation Evaluator’s office at IncomingTranscripts@highline.edu or call (206) 592-3618. Special registration days are set aside for new students before the beginning of each quarter. Students who have applied to Highline receive registration information with their admissions letter. New students are encouraged to take the COMPASS placement test and must attend a mandatory orientation if they have not attended college previously. During the orientation, new students meet with faculty and staff advisers who will assist in selecting classes. Currently enrolled students are assigned a specific time and date to register each quarter. Students may register at their appointed date and time or anytime thereafter. Students who have previously attended Highline are assigned a specific date and time to register before new students. The scheduled date and time is based on the number of credits the student has successfully completed at Highline. Students should plan to meet with their adviser prior to their registration time to make class selection and educational plans. Every student is encouraged to meet with a faculty adviser prior to his or her first opportunity to register. An evening student may visit the Educational Planning & Advising Center instead, if his or her faculty adviser is not available. An entry code is a five-digit random number that is needed to enroll for a class when permission or a prerequisite is required. If you need an entry code for a class, you will enter your request using the online Class Schedule. The request will be sent to an instructor or department coordinator who will review and respond to your request. For more information, visit https://registration.highline.edu/entry.codes.php. Photo identification cards are issued by the Registration office in Building 6. 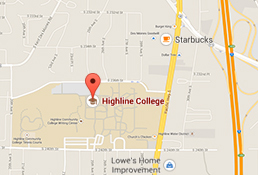 A schedule of classes is available online before each academic quarter at classes.highline.edu. Students may enroll for a course and choose an audit option if they meet the course prerequisites. This option allows students to participate in courses to explore or review a subject and not receive a grade. An audit does not calculate into the quarterly or cumulative GPA and is not included in the number of credits attempted or completed. A grade of “N” will be reflected on the transcript. Regular tuition and fees are charged. Students interested in auditing a class must have their instructor sign a Registration Add/Drop Form approving the audit. This form must be submitted to the Registration and Records Office by the Friday of the first week of the quarter or the Thursday of the first week of summer quarter. Requests after this date will not be accepted. Students who choose to audit may participate in the course to the extent that they desire, and are encouraged to discuss their desired outcomes with the instructor early in the quarter. Courses approved for audit may not be changed to credit classes. The audit option cannot be used in the Running Start, High School Completion, Adult Basic Education and English as a Second Language programs and is not an eligible option for students who utilize Veterans Affairs (VA), Financial Aid, Workforce Education and Workfirst funding. Once students have registered for classes, they may change their class schedules via the Web or by submitting a Registration Add/Drop Form to the Registration office. This form is available online at registration.highline.edu/docs/add.drop.pdf. Printed forms are also available in the Registration office, faculty buildings, and Advising Center. For information on deadlines for adding classes and making schedule changes, visit registration.highline.edu/calendar.php. An added class is not official until the registration process is completed and all tuition and fees are paid. Students with questions about changing their class schedule should consult with their faculty adviser before making any changes. To withdraw from Highline, students must complete a Registration Add/Drop Form and return it to the Registration office. Forms are available at the Registration office, faculty buildings, and Advising Center. Withdrawal is official when the form is received by the Registration office; however, no official withdrawals are granted after the last withdrawal date. For information about the last withdrawal date, visit registration.highline.edu/calendar.php. A W on a transcript signifies that the student has withdrawn from a class. In other limited situations the college or an instructor may also withdraw a student from class. If students simply stop attending classes and do not officially withdraw from college at the Registration office, they may be graded as having failed (0.0) each class in which they were registered. Note: Students receiving veterans’ benefits or other financial assistance must notify the appropriate funding office (i.e., Veterans Services, Financial Aid) of their withdrawal to avoid being indebted to the federal or state government. Students may withdraw from a class any time prior to the end of the eighth week of the quarter. Summer quarter or other special session classes must be dropped earlier. Visit registration.highline.edu/calendar.php. Students who drop a class prior to the published deadline will not have any grade posted on their transcripts for the class. After the published deadline, students who withdraw from a class will have a W recorded on the transcript. A W for withdrawal will be posted on the transcript; no credit or numerical grade is associated with a W.
Visit registration.highline.edu/calendar.php for published withdrawal deadlines. Instructors, at their discretion, may initiate a withdrawal for students who do not attend at least 60 percent of class during the first five instructional days of the academic quarter (or equivalent for summer); however they are not obligated to do so. Students who are withdrawn during the first five days of the quarter will be eligible for a full refund of applicable tuition and fees. Please note that the primary responsibility for withdrawing from classes rests with the student. Highline may withdraw a student from a class if the student has been suspended academically, has not paid tuition or whose conduct has resulted in a disciplinary suspension.